Fill it with water and a few floating flowers or with your tastiest delicacies - or simply display on its own. The blue of twilight, accented with purples and umbers, swirls in a spiral at the heart of the bowl. 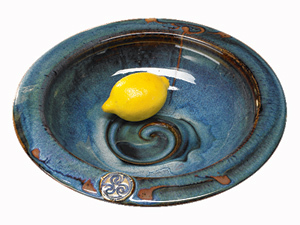 Wide beveled rim adds visual balance and makes the bowl pleasant to hold. Each is individually thrown and glazed by master potter Colm de Ris. Microwave, dishwasher and oven-safe stoneware bowl is 13 3/4" diameter; approximately 3" deep. Handmade in Dublin, Ireland. Gift wrap and rush delivery are not available. Click here for coordinating Colm de Ris dinnerware. I've been eyeing this collection for some time and finally broke down for the holidays and got it for myself. It is more beautiful in person and is great to display, or use for pasta, big salads or as a bowl to place camellias in. Just lovely. Just beautiful. Gave the bowl as a wedding present. Hope the recipients like it as much as I did!! Arrived on time. Both pieces I ordered came in perfect condition. No chips, no breakage and I absolutely love both pieces which were delivered in a timely manner. Thank you very much. The photos, while excellent, simply can't do this lovely bowl justice. I bought this as a gift to myself, and I never get tired of looking at it. It's displayed in my living room and never fails to get many compliments. I purchased this bowl as a gift to myself and I absolutely love it. It is a beautiful deep blue color and completely unique. I received it quickly (within a week) and couldn't be more pleased. Thank you! The bowl is absolutely beautiful and made a wonderful gift for my mother. The only draw back was that it did take a couple months for it to get here so the gift was late. But my mother was so delighted with the bowl, we both felt it was worth the wait.